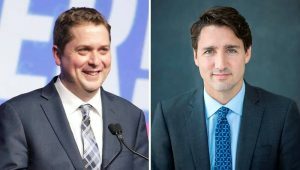 Scheer to Trudeau regarding threat of lawsuit on SNC-Lavalin controversy: Bring it on! CONSERVATIVE Party Leader Andrew Scheer on Sunday said that he would welcome court proceedings on the SNC-Lavalin corruption scandal after receiving a lawsuit threat from Prime Minister Justin Trudeau. Scheer received a letter from Trudeau’s lawyer on March 31 threatening a lawsuit over Scheer’s criticisms of Trudeau’s conduct in the scandal. Scheer released that letter on Sunday and also released a letter his lawyer sent on Sunday in response, dismissing Trudeau’s claims and urging him to proceed with the lawsuit so Canadians get finally get the answers they deserve on the SNC-Lavalin corruption scandal. Click here to view the March 31 letter from Justin Trudeau’s lawyer to Andrew Scheer. Click here to view the April 7 letter from Andrew Scheer’s lawyer to Justin Trudeau’s lawyer.